In a culture of continuous improvement, it is everyone's responsibility to ask questions about current practices in order to facilitate progress. Some improvement needs are evident and clear by all involved parties. When this is the case, the need to make changes is met with minimal resistance. Any stakeholder can ask, "How can we do this better?" and the improvement process begins! Unfortunately, suspicion can be a bad word. Those that are innocent until proven guilty are suspects. Elvis sang Suspicious Minds. (Although I prefer the Fine Young Cannibals version and the Dwight Yoakum version!) The idea of suspicion has generated more books and TV shows than any word other than love! When a need for improvement is suspected, rather than known, the improvement process is usually met with some level of resistance and the one who suspected the need for improvement is oftentimes suspected of foul play. More suspicion! Regardless, suspicion is how experts and visionaries make things move from good to great. They value excellence and celebrate success, yet they hold a certain amount of dissatisfaction for the status quo. They ask, "Why?" 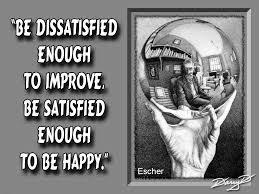 Dissatisfaction is another bad word. Too many folks see it as a sign of poor performance rather than an attitude of continuous improvement. Several years ago, I worked for a superintendent who told the district to, "Be dissatisfied." He passionately professed his belief that an attitude of dissatisfaction leads to continuous improvement. I walked away feeling empowered to question everything! Lots of folks walked away feeling like their good just wasn't good enough. In order to truly make things better and better and better, be dissatisfied and question your suspicions. Indeed, improvements will follow! Healthy dissatisfaction with the status quo and a suspicious mind will drive you to ask good questions and create a culture of continuous improvement!